Despite all of the positive momentum happening around the Anacostia River, one of the waterfront’s primary challenges still remains: getting to the river. The Anacostia River runs through over one thousand acres of parkland in the District of Columbia (more parkland than Central Park! ), and although many of these parks are right next to residential neighborhoods, they can be hard to get to and hard to find. Huge barriers like highways and large fenced-off parcels separate communities from the parks in their own backyard. Some of the few existing ways to get into the parks do not feel safe, inviting nor welcoming. As DC and Maryland continue to improve the quality of water and parks in the Anacostia corridor, similar efforts must be put into making sure that people can actually get to the ever-better river. Can you spot the Anacostia River in this picture? It's there, and this photo was taken on one of the few pedestrian bridges that cross the highway to get there in Ward 8. Streets and sidewalks lead straight to Yards Park in the Capitol Riverfront. There is only one portion of the waterfront where the District’s street and sidewalk grid extends all the way to the water’s edge. The neighborhoods of Buzzard Point and Capitol Riverfront provide easy access to the water’s edge. This was by design, as the recent boom in development that has occurred here (and will continue) was partially inspired by its waterfront location. Development in these areas has been guided by plans like the DC’s Comprehensive Plan, which includes policies to “improve the physical and visual connections between the waterfront and adjacent neighborhoods” (Policy UD-1.3.1), “promote continuous public access along the rivers” (Policy UD-1.3.2), “link the neighborhoods of Far Northeast and Southeast to the Anacostia River through trail, path, transit, and road improvements” (FNS-1.2.2) and “minimize the visual and accessibility impacts of railroad and highway infrastructure, surface parking, and industrial uses along the Anacostia River shoreline” (AW-1.1.8). These policies technically apply to the entire waterfront, but have only been realized to a large extent in these neighborhoods, in part because these are some of few areas where development can occur. This diagram shows major barriers to getting to the waterfront (highways, fences and large parcels) and highlights the few access points to the parks fro the adjacent neighborhoods, adapted from a diagram courtesy of SmithGroupJRR. Some of these physical and perceptual barriers will be broken down over time. As Events DC redevelops the RFK Campus, they may create a more permeable site that draws people to the river and to Kingman Island. As the Southeast Boulevard project continues at the same time as a nearby planned unit development and the adjacent Hill East Redevelopment, the boathouses along Boathouse Row may work with the District to implement a project like the 2009 Planning Study that would include more public access to the water. If you linger too long on the stretch of Anacostia waterfront between the river and the Arboretum, you might get stuck. The National Landscape Arboretum has also considered opening up a former entrance to add new pedestrian and bike access to the facility. There is a lovely stretch of waterfront accessible only through the Arboretum, which may then see more use. Circulation through this area will become even better when DDOT builds a planned pedestrian bridge between the Arboretum and Kenilworth Park, across the river. The difficulty of getting to the river is arguably more acute in neighborhoods east of the Anacostia. Due primarily to barriers imposed by Highway 295 and the CSX Railroad, there are only 5 ways to drive into the parks and a handful of pedestrian access points from DC neighborhoods nearest to the river. Finding these entrances to the waterfront is not always easy: the roadways can be confusing and feature poor signage, and the pedestrian walkways sometimes feel isolated and dangerous. This underpass at Good Hope Road SE does not make the entrance into the park feel warm, safe nor welcoming. This is a view from the Fairlawn neighborhood into the entrance to Anacostia Park. That is a long and dark distance to walk as a pedestrian. Can you spot the sign that lets you know you've entered a nationally significant park? This is the pedestrian bridge between the neighborhood around Anacostia High School and Anacostia Park, over Highway 295. While there are some transportation projects underway east of the river, they are not focused on increasing walkability to the waterfront. The Benning Road and Bridges Transportation Improvements project, led by DDOT and the Federal Highway Administration (FHWA), is a plan to improve safety, infrastructure and mobility on Benning Road between Oklahoma Avenue and the Benning Road metro station, but it is much more focused on optimizing lanes for vehicles and the expanded streetcar line than it is on improving the experience of walking to the river. This cramped sidewalk next to blaring traffic is the only pedestrian AND bicycle route to the waterfront from the neighborhoods near the Minnesota Avenue and Benning Road Metro stations. There is no sidewalk on the other side of this bridge over the railroad. The study area for the Benning Road project. Image from www.benningproject.com. There are ways to overcome these obstacles, and there are some projects underway to address them in DC. There are also examples from cities around the world that have overcome similar barriers and that can provide us some inspiration. 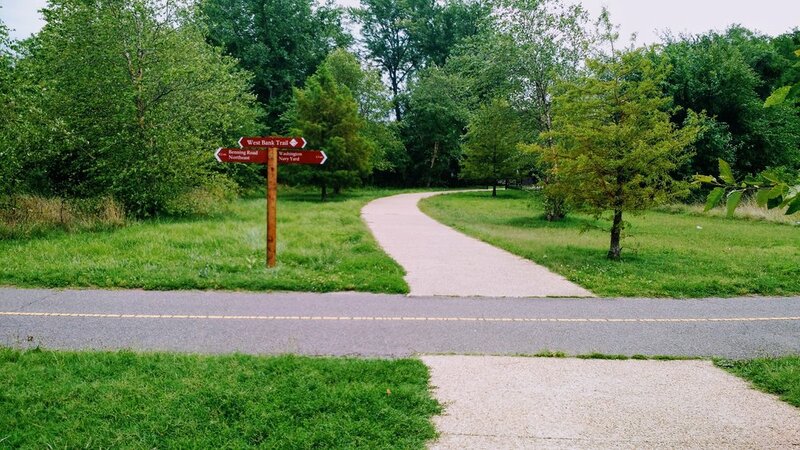 The District Department of Transportation (DDOT) and the National Park Service recently added some very helpful wayfinding signs to the Anacostia RiverWalk Trail, and the National Park Service has committed to improving signage throughout the park and enhancing the sense of arrival as people cross into Anacostia Park, especially during their 2018 Centennial celebration. The existing signs are a fantastic start to helping park users know where they are and where the trail leads. Signs along the Anacostia RiverWalk Trail are now spread across the waterfront and let you know how far you have to go until the next destination. The 11th Street Bridge Park has long recognized the challenge of access to the river. As they plan to construct a park that spans the river and has a foot in Anacostia Park near the intersection of Good Hope Road SE and Martin Luther King Jr. Ave SE, the organization behind the park has commissioned studies of walkability and access, and they recently worked with a local artist to improve the underpass that leads to the river. They also show how the route to the park might become more welcoming if lined with retail activity or closed to vehicular traffic like during their Anacostia River Festival. An installation by photographer Bruce McNeil lines the sidewalks through the underpass toward Anacostia Park at Good Hope Road SE. The annual Anacostia River Festival enlivens the street that leads into the park from Historic Anacostia. These same tactics could be applied to similar places upriver. Using temporary pedestrian improvements, visual art, improved wayfinding signage and even temporary greenery could help draw new people into the waterfronts. Temporary installations are useful ways to test strategies before investing a lot of funds into total transformations, and can help inform policies that lead to increased pedestrian safety and better wayfinding. 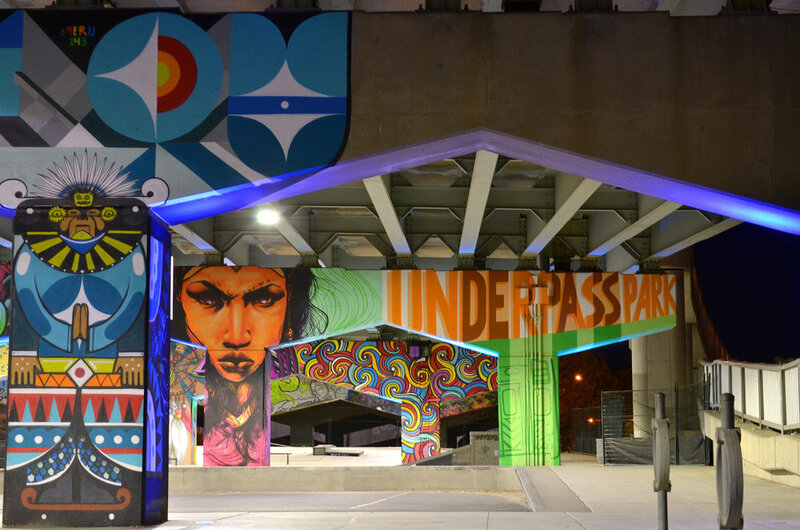 From blog.waterfrontoronto.ca: "The riotous graffiti artwork at Underpass Park takes full advantage of the imposing concrete beams and columns to create a fun and energetic atmosphere (Photo credit: Nicola Betts)." Temporary wayfinding signs like those from Walk [Your City] let people know how close some destinations are. The waterfront is a short walk from a lot of homes, but people may not know the way. Perhaps DC could develop a waterfront wayfinding program to increase pedestrian pathways toward waterfronts by enhancing signage, adding safety and comfort elements to sidewalks and adding public art that guides people to waterfront. Or, perhaps we could create a policy east of the river that ensures that pedestrian bridges are more frequent, feel safer, are easier to get to, and are greener. As we start with smaller, temporary and less expensive improvements, we can also look to other cities for bigger inspiration. St. Louis, like DC, has a waterfront park managed by the National Park Service and separated from the community by a highway. The future plans for the park include expanding the park over the highway: archpark.org. As the National Park Service continues to amplify its efforts to engage with communities to envision the future of its parks along the Anacostia River, it is important that other local and Federal agencies continue to partner with nonprofit organizations and residents to make sure we are improving residents' ability to get to the parks -- and make sure people know that there is even a park there.